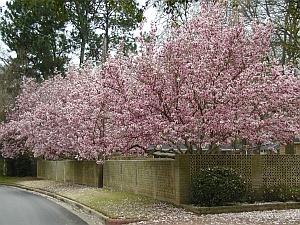 One of the classiest groups of trees for the southern landscape are the magnolias. Few trees say, “Spring is almost here!” as do the showy deciduous magnolias. This group of fine, ornamental small trees put on a display of colorful flowers long before the first leaf buds unfold. There are many species (about 90) and varieties of magnolias. The genus Magnolia is named for Pierre Magnol (1638-1715), professor of medicine and director of the botanical gardens in Montpelier, France. A few species are evergreen, and many lose their leaves in the wintertime. Some grow to enormous sizes, while others are less domineering and fit well into an urban or suburban home site. Of course, the main attraction are the large, beautiful flowers, many of which are quite fragrant. Many of the deciduous types bloom very early in the spring time, and occasionally frozen by mid-to-late spring freezes. Of all the magnolias, the native southern magnolia (Magnolia grandilfora), with its large, waxy, fragrant, white flowers and large, dark green, leathery, evergreen leaves, is a symbol of the Deep South. Flowering is most heavy in May and June, and then an occasional flower during the rest of the summer. Evergreen magnolias are not small, and can dominate the average small, modern urban lot. Fortunately, all the great qualities of southern magnolia can be found in the much smaller cultivar ‘Little Gem’ which only gets to about 20 feet tall by 10 feet wide. It fits in much better with smaller homes sites, and can be used for an accent, or even a large hedge. 'Teddy Bear' is another compact, smaller growing variety with wavy leaf margins and brown underneath. Michael Dirr, in his "Manual of Woody Landscape Plants" 1998 edition lists over 75 cultivars of M. grandiflora! Some of the more commonly available varieties include 'Bracken's Brown Beauty', 'D. D. Blanchard', and 'Majestic Beauty'. But, the deciduous magnolias are what catches folks attention in early spring, with loads of blooms borne before the leaves unfurl. Because of their early blooming season, some years the display may be cut short by a hard freeze during bloom. Winters which are relatively mild provide the greatest floral show. 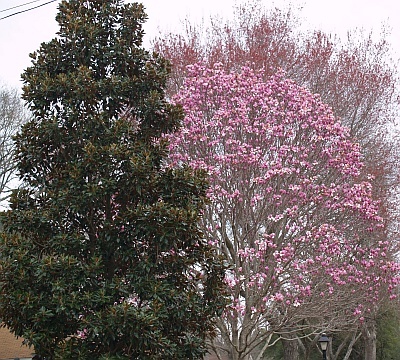 Deciduous magnolias can refer to any of a number of species and hybrid cultivars. “Deciduous” refers to the fact that the plant loses its leaves in the winter. 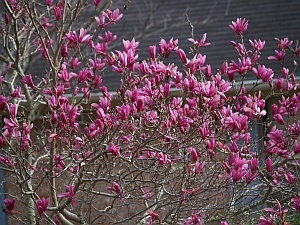 One of the most common, and oldest resident deciduous magnolias is simply known as the Tulip Tree or Saucer Magnolia. One must be careful with the common name “tulip tree” since there is a very large shade tree that is also known by that name. Also called Yellow Poplar and Tulip Poplar, Liriodendron tulipifera, can get nearly 100 feet tall! The tulip magnolia is also commonly called saucer magnolia and Japanese Magnolia, and sometimes just Soulangiana after its botanical name, Magnolia x soulangiana. Growing from 20 to 30 feet tall, and almost as wide, this small tree makes a tremendous statement in the early spring landscape. The attractive light grey bark on the typical multi-trunk tree adds its interest in winter. The flowers are large, often up to 9 inches, and variable in color, from pink to a pinkish purple. The saucer magnolia is a cross of the Magnolia deundata, the yulan magnolia, and Magnolia liliiflora, both from China. 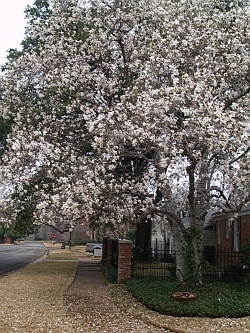 There are many cultivars of saucer magnolia listed, but you won’t find but a few in commerce. Usually they will be unnamed, or ‘Alexandrina’ which has large flowers with purple-rose on the outside of the petals while the inside is white. Star Magnolia (Magnolia stellata) is one of the earliest flowering magnolias, and thus occasionally loses its crop of prolific white, 4 inch, star-shaped flowers with 12 to 18 petals to a winter freeze. 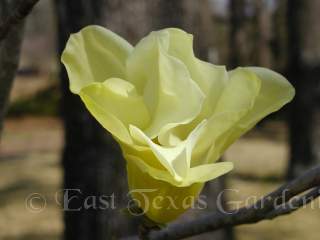 Examples can be seen in the SFA Mast Arboretum in Nacogdoches. Loebner Magnolia, (Magnolia x loebneri) is a result of a cross between M. kobus and M. stellata. There is a fine specimen in the Azalea District called ‘Dr. Merrill’ or just ‘Merrill’ with a nice upright growth habit to about 25 feet tall, and deep green foliage. It produces a profusion of fragrant, large white, starry flowers with a reddish center. Another cultivar often seen offered is ‘Leonard Messel’ with large flowers that are dark fuchsia outside opening to fragrant white inside. The tree has rounded habit growing to about 30 feet. Little Girl Hybrid Magnolias are a group of hybrids resulting from crosses made at the United States National Arboretum in Washington D.C. in the 1950’s of M. liliiflora ‘Nigra’ and M. stellata ‘Rosea’. This group of large shrubs or small trees produces outstanding floral display in early spring and blooms later than the M. stellata. Powdery mildew can occasionally make them look ragged. I’ve grown the cultivar ‘Ann’ for about 20 years, and it has slowly, but steadily grown and bloomed every year. This multi-branched small tree or large shrub is now about 10 feet tall. It bears large, upright red-purple flowers in early spring and with a slight fragrance. It makes an attractive, small ornamental tree with dark green glossy leaves. It occasionally gets powdery mildew which disfigures the leaves, but so far has not been severe enough to be a major problem. It should grow to a mature height of 20 feet. ‘Jane’ is another Little Girl hybrid, blooming a bit later than ‘Ann’, with spring flowers of reddish-purple with white inside making a magnificent display, growing to about 20-25 feet. 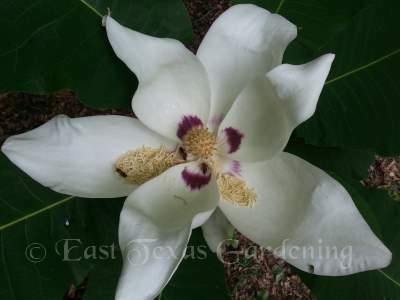 There are many other species and hybrid magnolias in cultivation – way too many to mention – having various characteristics of bloom and growth habit. Interesting new hybrids of Magnolia denudata (Yulan Magnolia) and the native Magnolia acuminata (Cucumbertree Magnolia) have cream colored and yellow blooms. Pictured here is the native Magnolia macrophylla with its gigantic leaves and large creamy white flowers with rosy centers. Not a tree for small yards as it can grow more than 40' tall. Fortunately for us in East Texas, it is rather easy to meet the cultural requirements for magnolias. They require an acid soil, which is what predominates in our area. The soil should be deep, with additions of organic matter, and well-drained. They do not do well on wet, poorly drained soil. Magnolias grow and bloom best in full sun. Plant in a location with good air movement to reduce the incidence of powdery mildew in the Little Girl types. Mulch well around the root area of the trees and do not try to grow grass under the canopy. Magnolias have fleshy, shallow roots and eventually only the toughest groundcovers can grow and survive underneath.